"I loved the NLP Practitioner course. It was an adventure in learning. It made a positive difference in my life, and the lives of many of my friends. The helpful wisdom can be applied in day-to-day conversation. Thank you for the time and effort you have put into preparing the course." "It is a great honor for me to write a few words for Steve G. Jones, who has had tremendous sucessess in the art and science of both hypnotherapy and NLP. He is not only the founder of an American Union of NLP, but also an expert NLP trainer. He has a Bachelor's degree in Psychology, Master's degree in education, an NLP trainer certification, a hypnotherapy certification, and is now completing his doctorate in education. Therefore, he knows how to properly train students. I have taken both the practitioner and master practitioner NLP courses and found the information not only very useful in my life, but also very helpful in treating my patients." "In addition to the amazing NLP course Steve has put together, the level of support I received was top-notch. Steve and his staff were always right there when I had a question or needed a helping hand. I would recommend that anyone who wishes to learn these valuable skills look no further than Steve G Jones. He is the real deal." "I have to say that I learned a lot more than I expected to from your course. I have already put to good use some of the techniques on myself and a couple of my Hypnosis clients. I also appreciate that you've made this course affordable to most. Cheers. I look forward to continuing my NLP education with you." "Let me tell you that I am enjoying your course on NLP. I have had a strong interest in hypnosis and always wanted to learn more about nlp as I know nlp can and has been used in hypnosis with great results. Thank you"
Ifyou are a professional, this course will take you to the next level! Steve shares his powerful marketing strategies and teaches you how to make $150/hour as a full-time NLP Practitioner! A: You get instant access to 10 hours of videos that you can watch online or download to your computer. 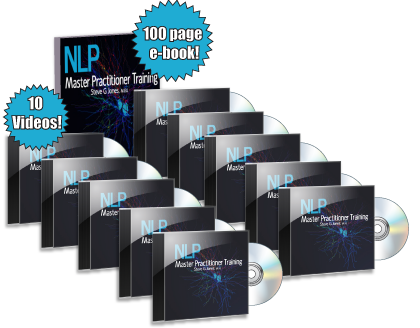 You also get instant access to Steve's 100 page NLP e-book. 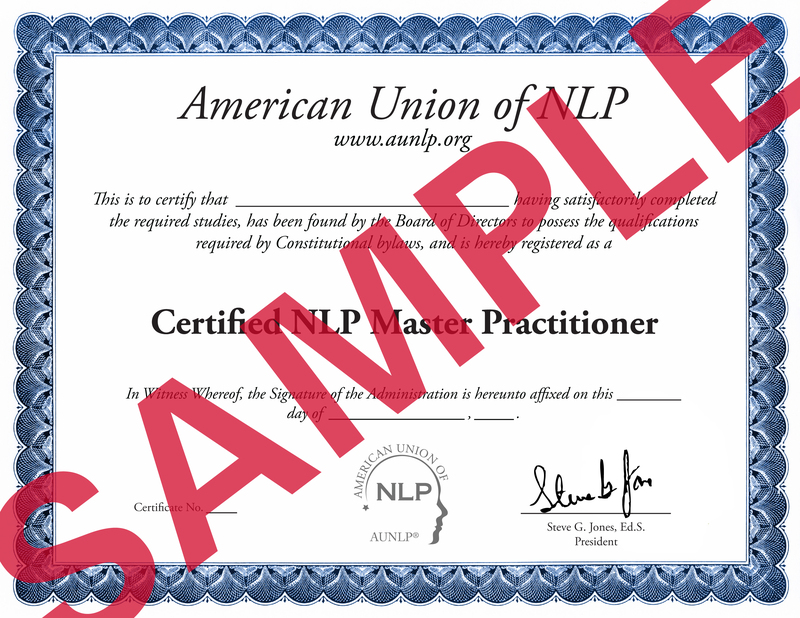 A: We will send your certification as soon as possible once we have reviewed your test materials and given a passing score..
A: Ideally an NLP Master Practitioner would be trained in a classroom setting with an instructor physically present. Unfortunately, this luxury is not practical for many people. When we factor in airfare, hotel, time away from work and family, etc. the costs both monetary and otherwise quickly add up. For this reason, many institutions have turned to online training as a viable alternative to meeting modern day needs. In fact, Columbia, Harvard, and Cornell have extensive online programs. Also, Penn, Dartmouth, and Yale offer online classes. Steve G. Jones, while working on his doctorate in education, extensively studied the online programs offered by Ivy League schools. He then was able to model the NLP training program to offer a similar level of training. Additionally, In this course, you are encouraged to find a study partner and to practice your techniques on a number of people. A: Upon completion of this program, you will receive a beautiful certificate sent via email, which you can print out and proudly display for your clients to see. It will have your name, title (Certified Hypnotist), and your certification number. A: Steve G. Jones has over 20 years experience as a certified clinical hypnotist, both teaching hypnosis students and working with clients. His list of former clients includes: Danny Bonaduce, Jeraldine Saunders (creator of the Love Boat TV series), Tom Mankiewicz (writer of Superman the movie), and many other celebrities. Steve has served on the board of directors of the American Lung Association in Los Angeles, California. He is a member of the National Guild of Hypnotists, National Board of Certified Clinical Hypnotists, founder of the American Alliance of Hypnotists, member of the International Registry of Clinical Hypnotists, has presented his hypnosis research at the American Council of Hypnotists Examiners, received the President’s appreciation award for his outstanding contributions to the American Association for Adult and Continuing Education, is a member of the American Board of Hypnosis, member of Who’s Who among Students in American Universities and Colleges, member of Pi Lambda Theta International Honor Society and Professional Association in Education, member of Omicron Delta Kappa Honor Society, member of the Golden Key Honor Society, recipient of the National Leadership Award from the United States National Congressional Committee, received a bachelor’s degree in psychology from the University of Florida, received a master’s degree in education from Armstrong Atlantic and State University, received the educational specialist degree from Georgia Southern University, and is currently a doctoral candidate in education at Georgia Southern University. Steve has recently been featured on TruTV, CNN, and is under a development contract for his new television series on hypnosis. A: Yes. You will be listed on the international online list of Certified NLP. A: You must complete the NLP Practitioner certification course before enrolling in the NLP Master Practitioner course. Through this course you will master advanced applications of NLP -- learn and create new patterns and strategies for success, happiness and achievement. You will move to the forefront of the field and participate in the future of NLP by creating new patterns. "Steve G. Jones is a highly trained and talented NLP instructor. As a medical doctor interested in helping patients, I have always been interested in exploring various healing methods, including NLP. The NLP course taught by Steve G. Jones has given my the courage, motivation, and knowledge to use NLP successfully with my patients." "Thanks to Steve G. Jones, I am able to move forward in learning and helping other people. The NLP course made the concepts and the language easy to understand and encouraged further study. Thank you for this opportunity to further my career and my LIFE! You are known around the globe. My Associate in the U.K. put me in touch with your program. Again MANY THANKS!" "I'm an online graduate of the American Alliance of Hypnotists. I can honestly say that this is the fastest, easiest way to learn in your spare time. Steve G. Jones corresponded with me constantly and was always there to answer my questions. Thank you, Steve, for helping me launch my new career as a hypnotist!" "This is really very fascinating. As I have been practicing clinical hypnosis with some of the troops, it has helped to quell some of the PTSD symptomatology and panic responses. I hope to use hypnosis more both here in theater and at home in my practice as well. I am an Adlerian psychologist and although I studied some Ericksonian ideas, reading more about the theory and its clinical application is really very cool. Great stuff. I am glad I ran into you online. Two more modules and then I am looking forward to the advanced course." "Steve G. Jones exhibited great insight and sensitivity during our time together. I would recommend his services to anyone seeking aid with the elimination of unwanted habits." ENROLL NOW FOR JUST $147!